Foxy Brown. Coffy. Kit Porter. Hot. Gutsy. Trendsetter. Backup singer. Movie star. This is Pam Grier. Everyone has a story to tell. This is why I love memoirs. Some are fascinating, others not so much. Pam Grier is such a good actress, that when I see her on film, I think of the character she is playing. But who is the woman acting? I was interested in her story. Where she came from, how she grew up, juicy personal deets to her love life, and inside secrets of the film industry are what I wished to read about. In general, my curiosity was satisfied. 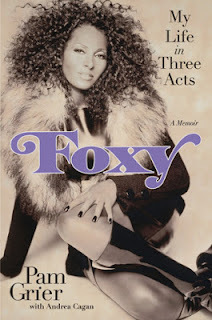 Pam Grier's memoir was somewhat revealing. She wrote about her relationships with Kareem Abdul-Jabbar, Richard Pryor and Freddie Prinze Sr. And sure, there were shocking parts of the story. But jaw-dropping revelations? No. Most of all, I admired Pam's ambition. She was born into a military family in Winston-Salem. Later labeled as one of the most beautiful women alive, but as a little girl she wasn't welcome on buses, in restrooms or in restaurants. She grew up during segregation, yet didn't end up feeling inferior to others. Pam also battled cancer. And let me not forget mention, she was in legendary acting roles. Pam "Foxy" Grier is an example of a strong black woman! Foxy: My Life in Three Acts is her story. It is recommended non-fiction reading for Black History Month.